Let this premium Soil pH Tester Make You be a Good Plant Carer ! 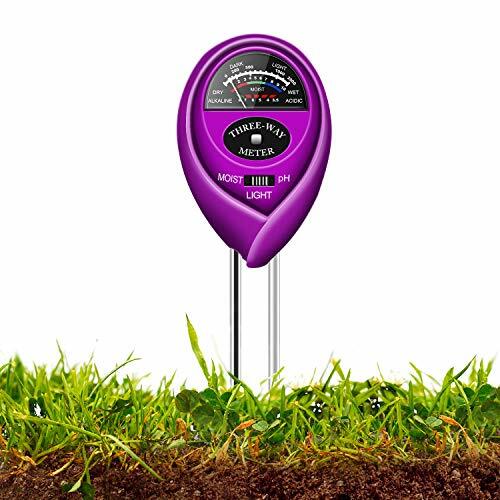 This 3- in-1 soil moisture pH meter is designed to better know the condition of your plant, detect soil moisture, help you know the pH value of the soil, determine if plants get enough sunlight to keep plants grow healthier ! 【MAKING YOUR DREAM GARDEN EASIER】: Our 3 in 1 pH moisture meter can Find out what your garden or lawn needs .You can now know if you need to watering your soil, amend its pH levels or adjust its lighting !Help your garden plants healthy and growthful. 【NO BATTERY NEED】： The long probe plant moisture meter with light & pH test function don't need batteries,so you can use it indoor or outdoor. Insert this soil test kit into the soil around 2-4inches, then toggle switch to tester what you want to measure.it is very eazy to control . 【ACCURATE READING 】:Our premium soil meter moisture can test pH Range: 3.5-8ph (3.5-6.5 Acid, 7-8 Alkaline), Moisture Range: 1-10 (1-3 Dry, 4-7 Nor, 8-10 Wet), Relative Light: 0-2000lux (0-200 Low, 200-500 Low+, 500-1000 Nor, 1000-2000 High).After a while, you will get a accurate data. 【INDOOR & OUTDOOR USE】 : Ideal and necessary soil care tool for gardeners, outdoor & indoor plants, gardens & grass lawn, fruits, flowers, vegetables, shrubs, etc. 【TIME-SAVING & COST EFFECTIVE】: this premium soil test meter saves you both precious time and money, by helping you maintain your soil and, consequently, your garden or lawn in tip-top condition!We firmly believe that our gardening soil test kit is the best product your money can buy. If you have any questions about this product by Geekroom, contact us by completing and submitting the form below. If you are looking for a specif part number, please include it with your message.